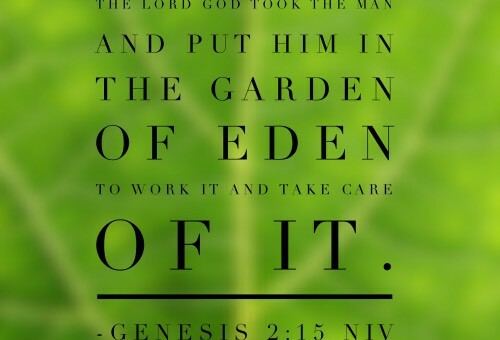 In Genesis 2:15 we read that God took man, put him in the garden to work and take care of it, AND God supplied all man’s needs. Today, through the blood of Jesus Christ, the only begotten son of God, we have salvation which begins our PREPERATION. We must confess/repent/ and allowing God to take control of our lives. Blessing have been PLANTED in our lives and are scheduled to come up at the assigned time for to everything there is a time and a season; We are PRUNED through the in-filling of the Holy Ghost, and while being pruned is painful, it is a necessary part of our spiritual development if we are to bear fruit. We must stop searching for gardens that have already been pruned. We must go through our own struggles, shed our own tears to water our own garden. We must prune our own relationships, and not walk in the counsel of the ungodly; we must prune our own children, pulling the weeds of disrespects and disobedience from their gardens; prune our own business, by allowing God to be our Business partner. In pruning we are able to bear good fruit; Fruit of the Spirit, Love, peace, joy, longsuffering, gentleness, goodness, faith, meekness, and temperance. Pruning develops our Faith in God, our Trust and our dependence on him to take control of our lives. Pruning develops our prayer life, our bible study life and our praise songs. As we now walk with God, we begin to PROSPER. He becomes our protection, our healer, our deliverer, in HIM do we trust. Salvation has been prepared for us… we have been planted through the shed blood of Jesus Christ our Redeemer; we are pruned by the In-filling of the Holy Spirit, and thereby empowered to prosper. Now… work your garden and walk in the Fruit of the Spirit.